How Do You Find the Common Difference in an Arithmetic Sequence? Trying to find the common difference in an arithmetic sequence? You need to figure out what number you need to add to each term to get the next term in the sequence. It's easier than you might think! Watch this tutorial and learn how to find the common difference in an arithmetic sequence. Got a set of numbers? Are they in a particular order? If so, then you have a sequence! Take a look at sequences by watching this tutorial. Did you know that the constant you add to a term in an arithmetic sequence to get the next term has a name? It's called a common difference! 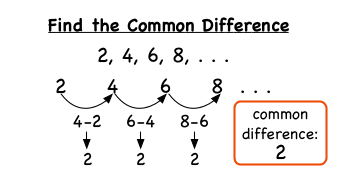 This tutorial is a great way to learn more about the common difference of an arithmetic sequence. How Do You Find the Next Terms in an Arithmetic Sequence? To find the next few terms in an arithmetic sequence, you first need to find the common difference, the constant amount of change between numbers in an arithmetic sequence. Once you know the common difference, you can use it to find those next terms! This tutorial takes you through that process, so be sure to check it out! How Do You Find the Nth Term in an Arithmetic Sequence? Got an arithmetic sequence? Trying to find a later term in that sequence? Don't want to keep adding the common difference to each term until you get to the one you want? Then use the equation for the nth term in an arithmetic sequence instead! This tutorial will show you how!